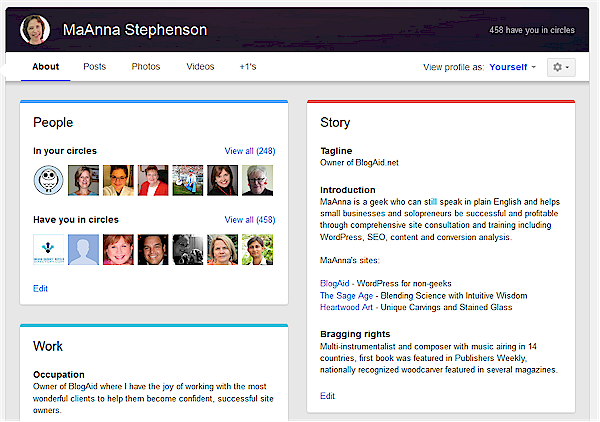 Google+ has made two significant changes to the user profile. The one that’s getting the most press is the much larger cover image that has no crazy restrictions on it like those on Facebook. But, the changes that will really matter to your SEO and AuthorRank are those that were made to your About page. Discover what changes were made and how you can capitalize on them. The first thing you notice when you click your About link is the clean layout it now has. All of the sections are laid out in distinct Cards that are color coded. When you click the Edit link on any of them, you are taken to a new Editor pop up. Each icon at the top takes you to the different Card sections. And each is color coded to match. In other words, the background color at the top of the editor changes to match the strip of color at the top of the Card. The second link in the Editor is for your Story, which was previously your Bio information. The Tagline and Introduction will be the first thing new visitors see in your G+ Profile, so make them count. The third link is the Work icon and it contains a new field to list your Skills. This is a great place to enter a few keywords for what you do too. Next to the end is a Link icon, and the settings in it will make the most difference to properly configuring and closing all of the loops to make AuthorRank work at its best. And that’s important because there is actually a loophole that scrapers can use to make it look like you are providing content for their site that you didn’t write. I’m in the process of updating the Google+ Profile Settings module in the SEO and AuthorRank Video Course to reflect these new changes. It covers all 14 connections you can make to close all of the loops so that AuthorRank will work at its peak for you. It also includes every single setting in the WordPress SEO plugin and settings in the WordPress core, plus additional settings that your theme may offer. I don’t just tell you how, I tell you why, and explain the best ways for you to set all of the options to work well for your site and goals. This Course is also available in the full VIP Video Library that includes WordPress, Genesis, and MailChimp. I just now spent a fair amount of time updating my google+ profile based on your recommendations. Thank you, MaAnna. I was able to update everything quickly and smoothly without a hitch, but I did want to report on something sneaky that Google does that I don’t appreciate. In the links section, it gives you the oportunity to add custom links and link other social media profiles. Good. When you’re viewing your google+ profile as yourself, the youtube link is conveniently disabled. That means you don’t know it’s there and can’t modify it until you view your google+ profile as public. Once you’re in public view, you notice that your youtube account is conveniently the first clickable link that people can click from your profile. For people like you and others who post or create professional videos and upload them to youtube as part of their profession, that is good. For those of us who are mere viewers and entertain our kids by playing rounds of Teletubbies, this option is stupid and meaningless. And yet, I cannot delete the youtube channel from my profile! Amanda, glad you found it helpful! On the Links edit page, below the Add Custom Link, you’ll find another one for managing your links. It will take you to another page with a list of all the platforms Google recognizes you on. You can check a box there to not display it on your G+ profile. As I stated in my original comment, Google+ disables the Youtube link. There is no way to remove it from one’s public google+ profile. Thanks, Hugh. And I’ve been enjoying all of the examples you’ve been posting on how to make the most of all that huge image too! Wow! I saw some of the changes earlier this week, but didn’t see all those great edit features. Thanks for clarifying them for us. Yeah, I’m really liking the new layout. So much easier to find all of the features. I even found one little hidden gem that let me know which of my other platforms had been verified. Will have them all in the updated vid tut in the course. Google+ About Us page will compete with facebook’s new planned news feed page, I saw demo of facebook’s new newsfeed page, that was awesome. Did anybody notice..? I’ve only seen screenshots so far of the new Facebook news feed, so can’t compare actual function yet. But, not sure how just the changes to your About page on your G+ profile can compete with a full stream on a news feed. Maybe you can give us more details. 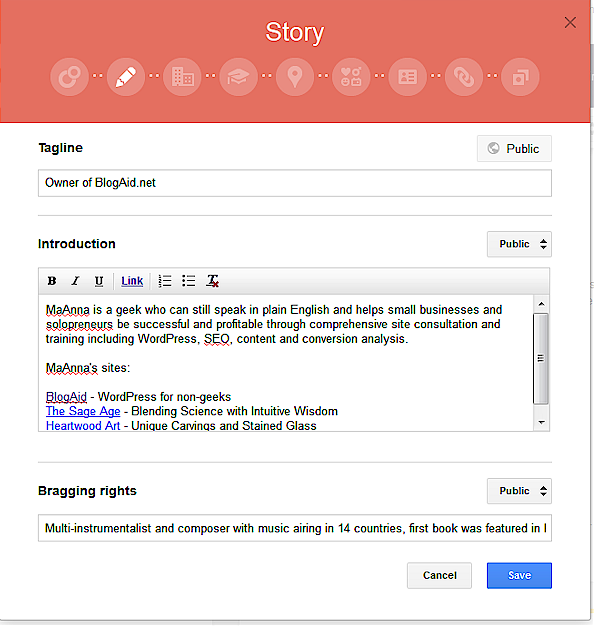 I have just been looking in to google authorship and have just set up a google+ account so that I can set it up. Is it very difficult or can anyone set it up??????? Lee, anyone can do it and I have a full video course to ensure that you make all 14 connections and properly close all of the loopbacks. You’ll know exactly what you are doing and why, and which options work best for your exact situation. That’s important because things will change as we go and you’ll want to know exactly how those changes impact you and what do do about them. I keep the course updated with those changes and send you emails to let you know exactly what they are.